The most popular sound system face-off series is back. The STAR and Magnum are once again gearing up to host the weekly music clash event, dubbed the Magnum ALL-STAR Face-Off. The series, which will run for six weeks, will feature some of Jamaica's most popular celebrities from the entertainment and political landscape. Four sound systems will also go head-to-head to be crowned the ultimate ALL-STAR champion selector and walk away with $1,000,000. This year, the celebs will also be in on the money. The winner of each selecting battle will walk with $100,000, while the loser will get $50,000. A per cent of each will be donated to a charity of their choice. The clashes will take place in the Famous Nightclub, Portmore, St Catherine, as of October 30, and will see the four selectors/sound systems going head to head for weekly points. Competing in the clash are multi-award winning Bass Odyssey from St Ann, the legendary Fire Links, Kingston-based Richie Feelings and the enigmatic Uncontainables. As for the celebrities, patrons can expect to see clashes between politicians Olivia 'Babsy' Grange and Kari Douglas, comedians Pretty Boy Floyd and Oral Tracey, music producers Skatta Burrell and DJ Frass, sports personalities Warren Weir and Dane Nelson, artistes TOK and Twin of Twins, and others. According to Oral Tracey, who is set to go against Pretty Boy Floyd on November 27, fans can expect the unexpected. "My head nuh good. A me name Maverick and mi a come fi tek dis. Floyd a mi fren inna real life, but if a war, a war. I'm looking forward to it. The adrenaline start rush. Floyd say him name Boasy Boy Floyd now, but when mi done wid him, him nah go Boasy again. Memba dat," Tracey told THE STAR. The popular and iconic Richie Feelings, who is set to battle Uncontainables on October 30, the first night of the competition, stated that Bass Odyssey will be his biggest competitor. "Bass Odyssey are World Clash champions, so they would be the biggest challenge for me," he said. Questioned as to what he would do with the million-dollar pay out, should he win, he stated that he was not sure. "I'm not even know enuh, cuz a nuh much I'm can do with it," he said. 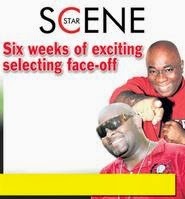 The Magnum ALL-STAR Face-Off will also have celebrities Skatta Burrell and DJ Frass on the first night of the event. The clashes will be held each Thursday night starting at 11 p.m. sharp, so patrons are encouraged to turn out early. Admission for the event is $500 for females, while males will be charged $1,000 at the gate. There will also be special deals on beverages, courtesy of title sponsors Magnum Tonic Wine. Other sponsors for the event are Famous Nightclub and Lime.